Forbidden Island is a game with a difference... either you all win, or the game wins and you end up being swallowed up by the dark swirling waters! Join your fellow adventurers on a do-or-die mission to capture four sacred treasures from the Forbidden Island. You'll need to work together to move around the island as it tries to thwart your efforts. 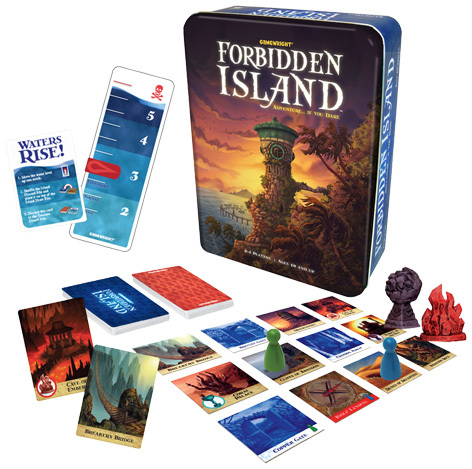 From renowned designer Matt Leacock – an established name in the ‘Games for gamers’ market, Forbidden Island has successfully made the crossover into mainstream family games due to its high quality and engaging game play - you really are on the edge of your seat whilst the final few moves are being played out. Please tell us what you think of the Forbidden Island by Coiledspring Games.